I took this picture as soon as I finished binding number 120. Taken on Tuesday, Feb. 20, 2018. I managed to finish all of the charity quilts on Tuesday! I wondered if I would have a "lack" in my life when I finished them. I was considering this as I trimmed the last threads from binding number 120 this morning. My husband said he would be embarrassed to admit it if he managed to finish a YEARLY goal before the end of February. Of course the implication is that the goal is too small. I've started doing some badly needed cleanup around my table and in my sewing room. I also need to clean my bathroom and my bedroom etc. It's all gone kind of by the wayside while I put my whole focus into finishing those charity quilts EARLY this year. So, no, I don't feel guilty. In fact, I feel quite relieved, and actually happy! Yes, happy. Sandwiching a beautiful donated quilt top! Lydia helped me sandwich almost half of the 120. We ran out of safety pins at 58. We did this mostly in early January before she headed back to college. I do appreciate all of you readers. Several people sent me quilt tops to finish - so of those charity quilts, in truth, I didn't make very many of them 100% by myself. Some are panels I added borders to. But I did sandwich (Lydia helped me sandwich about half of them), quilt, bind, label and am in the in middle of washing all 120 (I've got 60+ washed as of this writing) -- oops, no, my daughter, Lydia, quilted one of them - but I finished it up so I'm counting it in my total. And it's not as if this is my only quilting goal. This is just the first one and one that is related to charity quilts. I want to prepare a bunch more tops during the warmer months so I can have them ready to finish whenever I am in the mood to tackle another batch. I already had almost all the tops ready to go when I started on these - it's the only way I could have done this so quickly this year. I also have a pretty unique way of looking at a finished top *but not yet quilted". To me it doesn't feel like a UFO - it just feels like a finished top. I don't really consider those things UFOs unless they are not yet in completed top form. I look at an unquilted top a little differently than a top that is in hundreds or thousands of pieces. I kind of put it in a different category, I guess - one all of its own. But that's for a different day. Sandwiching this beauty! 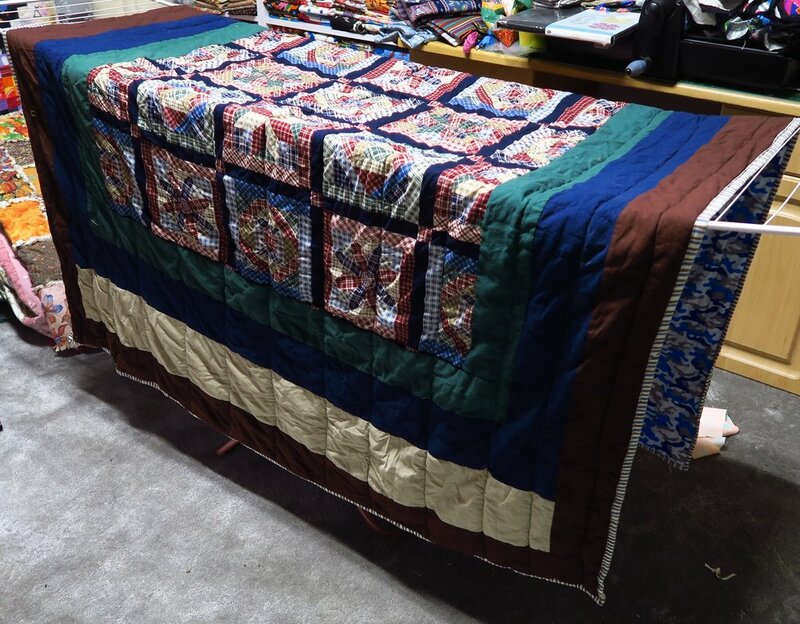 Can you believe someone donated this hand done quilt top? It is truly an amazing quilt! In this case, my desire was to finish this big goal early in the year. So yes, it is sweet. Learning the binding attachment has been a huge blessing and helped me finish these tops more quickly than I could have otherwise. I've not wanted to focus my blog posts on charity quilting as most of this process has been rather basic and possibly not interesting to you. But here are some pictures reflecting this work. My washing machine, while large for a European model, really only holds one quilt at a time. The quickest load takes 1 hour 35 min. So far I've washed 60 quilts. I'm just letting them air dry. This saves me the cost of running the dryer for 120 quilts! A stack of finished quilts ready to photograph and take out of my house. Quilts in the back of the vehicle ready to head to the church building where I am keeping them til I have a give-away. And once again - here's a collage showing various pictures of the whole process! You'll be seeing more of these quilts as each charity quilt gets it share of the spotlight as I feature them, 10 at a time in the next few weeks. But if you need something from my sis, be sure to check out what she has in the store!